WD's next generation NASware 2.0 technology improves NAS storage performance by reducing common hard drive concerns in NAS systems. This includes concerns for things like compatibility, integration, upgrade ability, reliability and cost of ownership that are experienced with a hard drive designed for desktop computers. 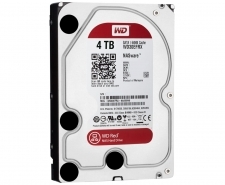 Every WD Red hard drive comes with our world-class professional support services including a premium dedicated 24/7 support line and a 3-year limited warranty. Enhanced reliability - Since your NAS system is always on, a highly reliable drive is essential.